PALFINGER is setting a technological benchmark with the new access platform from the “Jumbo class NX (next generation)” model series. First time ever shown on a 2 axle chassis is the impressive height of 48 meters and an outreach of 31.5 meters. The P 480 thus reaches a new record in its class. The new X-jib also allows precise work of the highest standard and gives the new PALFINGER P 480 access platform a freedom of movement never known before. PALFINGER is opening a new chapter in the field of ultra-modern access platforms with the new “Jumbo class NX” model series. The combination of innovative technology, weight-optimised design and unparalleled flexibility during usage makes the new P 480 access platform a universal talent for the most varied of tasks. 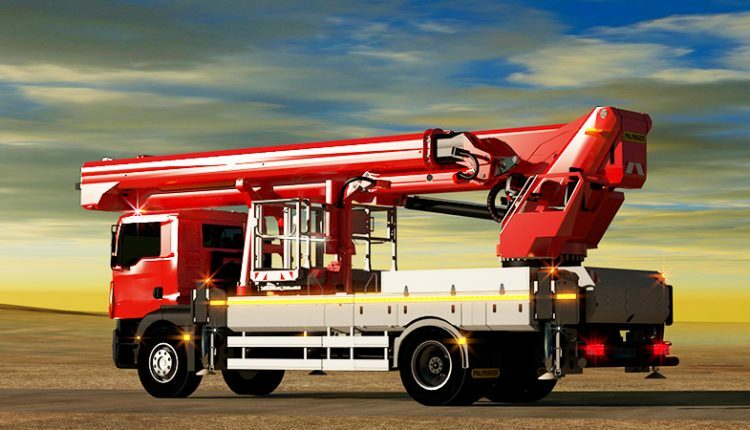 The unique manoeuvrability of the new P 480 is all thanks to the new additional jib boom. The hydraulically operated X-jib between the upper boom and the workman basket gives the new P 480 access platform with a 240˚ movement radius unparalleled abilities when it comes to assuming a precise position high up in the air. Together with an amazing 400° (2×200°) workman basket rotation exact alignment with buildings, masts or beneath overhangs, just like a wrist on an outstretched arm. Thanks to this enormous flexibility and the sensitive proportional controller, the new access platform can now take on demanding tasks at a huge height as well, tasks in which conventional access platforms reach their limits due to their design. This expanded potential range of applications offers PALFINGER customers access to new, attractive fields of work. The new access platform scores points, not just thanks to its technical excellence. With its weight-optimised design involving special profile structures and high-strength materials, the P 480 looks good on the scales as well. The total weight of the truck access platform is well below 18 tonnes, and its compact, space-saving design allows tools, accessories and material to be brought along on the vehicle. And yet, no compromises have to be made during operation, and there are no additional costs or HR outlay. The high load and the extraordinarily large amount of space available make operation much more effective. Starting from the very first time of use, the new PALFINGER P 480 access platform therefore pays directly into the operator’s bank account.